In a lot of ways, losing weight is like having a budget – it all comes down to numbers. To save money, you have to spend less than you make. And if you want to lose weight, you have to take in fewer calories than you burn. However, maintaining a desirable weight involves more than just counting calories. 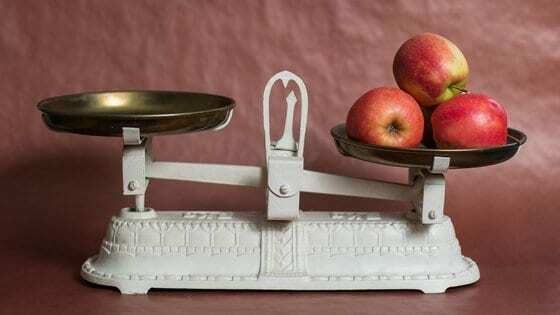 There are many factors involved with keeping those scales at a healthy number. If you want to keep yourself from obsessing over food, and yet maintain an appropriate weight for your age and build, start by asking yourself these 5 questions. 1. Am I eating breakfast? There are good reasons why it’s called the most important meal of the day. 2. Am I getting enough protein? Keeping your body supplied with enough protein not only curbs hunger and helps you maintain a healthy weight, it also builds lean muscle, reduces muscle loss, and helps with recovery after exercise. 3. Am I getting enough water? A lot of times we may think we’re hungry – but in reality, we may just need a glass of water. Hunger and thirst trigger the same type of signal in the hypothalamus (the part of the brain that controls feelings of hunger and thirst). We lose moisture throughout the day through sweat, urination, and that constant thing we do – breathing. On average, we need 91 to 125 ounces of water each day. It’s best to try and get 8 or 9 glasses of water throughout the day, but you can also get water from fruits, vegetables, and broths. If you think you’re hungry, try downing an 8-ounce glass of water first and waiting 10-20 minutes. If you’re still hungry, then go ahead and grab a healthy snack. Your body will only be the better for having had the water. 4. Am I getting enough sleep? It’s officially a fact – studies show the less sleep you get, the more weight you’re likely to gain. For the record, ‘enough sleep’ for adults is generally defined as 7 to 9 hours per night. When we don’t get enough, certain hormones which increase appetite or tell us we’re full become imbalanced. People who are chronically sleep deprived tend to feel hungrier and eat more often. They also tend to be drawn more to unhealthy foods. Adequate sleep has restorative benefits for both body and mind – it’s an important component for maintaining a healthy weight. 5. Am I building any muscle? Muscle is good, very good. Resistance training like lifting weights or doing yoga will help you build and hang on to muscle mass, which not only boosts your metabolism but burns calories at a higher rate, even when you’re at rest. And you don’t want to forget to work that greatest of all muscles – the heart. Doing cardio exercise like jogging or swimming is not only good for it but also chips away at that unhealthy belly fat which builds up around your internal organs to cause imbalance and disease. There are many factors which contribute to the why and how of weight gain, but knowing the answers to these five questions can give you a definite foot-up. Talk to a wellness coach today if you have questions about how you can get on (or get back on) track.